Learn how to schedule and automate custom reports. Scheduled LMS Reports enable you to set up reports to be emailed or saved as a document at regular intervals. After these reports are scheduled, you can run them at will, temporarily disable the report, or remove it entirely. One of the great things about scheduled lms reports is that you have control over what fields appear in the report. You can choose from any of the user profile fields (including the 15 customizable ones), as well as course data such as progress, average and time spent in the course. 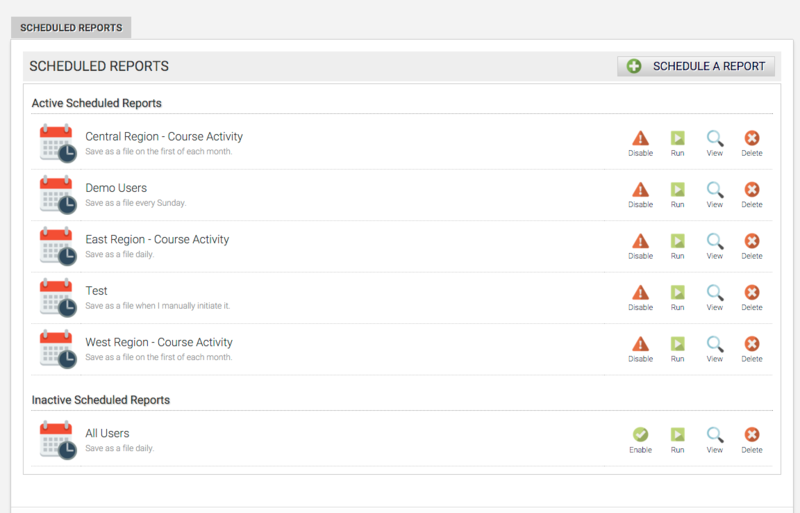 They also have similar filter settings like the lms course reports do. With scheduled lms reports you can use the email settings to specify who you would like these automatic reports to be sent to. This may come in handy if you have specific people in charge of certain users or to send reminders to the admin. Inside the Axis LMS, the admin, report admins, and certain managers are all able to see their own reports when they log in. However, not everyone is keen to the idea of logging in to view reports – for cases like these, scheduled reports come into play. Scheduled Reports can be used as way to save or send reports out to an email address regularly; or on a one time basis. These settings affect how the Report is delivered, and when it is delivered. If you’re sending this Report as an email, these settings will determine who it is sent to, along with any additional body text. These settings are where you’ll refine what users should be included in this report. Drill down into usergroups, profile fields, courses, time spent in course, and more. For example, an admin can choose to create a report that includes only users from “Atrixware” whose average inside a Course is at least 50%. This section allows the admin to determine what fields should be included in the report, and in what order they should be delivered. Using these settings, an admin can add and remove fields into the report, then drag and drop the included fields into an order that makes sense for their business. After you’ve created your report, it will now appear on your list of reports along with several tools. These tools allow you to temporarily disable the report, run the report, view how it was created, or remove it entirely. This entry was posted on Tuesday, October 18th, 2016 at 10:05 am	and is filed under ELearning 101. Responses are currently closed, but you can trackback from your own site.